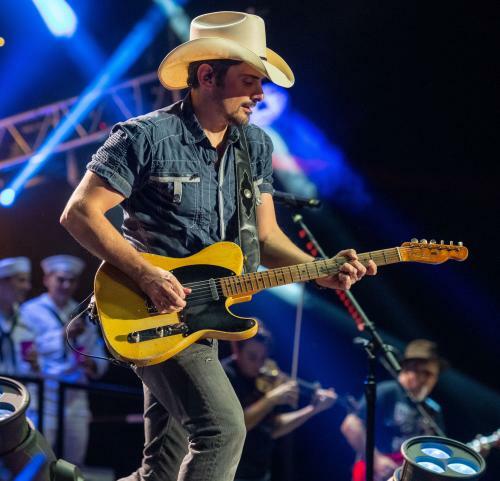 NASHVILLE, Tenn. Country music superstar Brad Paisley has announced his 2019 World Tour, which kicks off May 30 in Albuquerque, NM. Special guests on the U. S. tour dates will be Platinum-selling hitmaker Chris Lane and rising singer-songwriter Riley Green. Lane will also be on the European dates. Additional 2019 tour dates to be added soon. Fans can purchase tickets for all dates now at www.bradpaisley.com. Live Nation is the official promoter of the tour and select cities are part of Live Nation’s Country Megaticket at www.megaticket.com. Brad Paisley is a critically acclaimed singer, songwriter, guitarist and entertainer whose talents have earned him numerous awards, including three GRAMMYs, two American Music Awards, 14 Academy of Country Music Awards and 14 Country Music Association Awards (including Entertainer of the Year), among many others. He has been a proud member of the Grand Ole Opry since 2001. Paisley has written 21 of his 24 #1 hits and has accumulated over 20 million career total worldwide album sales, track downloads and streaming equivalents. His 11th studio album, LOVE AND WAR, which was released April 21, 2017, was his 9th consecutive studio album to debut #1 on Billboard’s Top Country Albums chart. On April 28, 2017 LOVE AND WAR was released as country music’s first ever visual album for a limited time exclusively on Apple Music and now is available on VEVO. Paisley has partnered with Boot Barn® and developed an exclusive line of jeans, hats, T-shirts, jewelry, belts and woven shirts called Moonshine Spirit by Brad Paisley. Connect with Brad at www.BradPaisley.com,www.Facebook.com/BradPaisley, on Twitter @BradPaisley, on Instagram @Brad Paisley, and YouTube atYouTube.com/BradPaisley. Since bursting onto the scene with his breakout #1 smash “Fix,” Chris Lane’s star continues to rise with GOLD and PLATINUM level single certifications, two Top 10 albums and 850 million+ combined streams. Out of the gate, his irresistible new single “I Don’t Know About You” is climbing the Country radio charts and follows the success of his hit collaboration “Take Back Home Girl” with Tori Kelly. Both songs are featured on Lane's Big Loud Records sophomore album – LAPS AROUND THE SUN – that made a chart-topping debut, landing at #1 on the iTunes Top Country Albums chart and inside the Top 10 of Billboard’s Top Country Albums chart for the second time in his career. Gaining recognition, Lane was named one of MusicRow Magazine’s 2017 Next Big Thing Artists, has scored nominations at the iHeartRadio Music Awards, ACM Awards and Radio Disney Music Awards and appeared on TODAY, The Bachelor, The Tonight Show Starring Jimmy Fallon, Late Night With Seth Meyers and CONAN. Previously landing coveted opening slots on tours with Florida Georgia Line, Dustin Lynch, Garth Brooks, Tim McGraw + Faith Hill, and Rascal Flatts, the Kernersville, NC-native closed out his second headline run – the LAPS AROUND THE SUN TOUR – in January. Born in Jacksonville, Alabama, Riley Green was raised on the sounds of old traditional Country, Bluegrass, and Southern Gospel music. He learned the spirit of songwriting and performing at a young age while spending time with his grandfather, Bufford Green, who ran Golden Saw Music Hall. Riley shared the stage with him and other men of his generation, laying a foundation for the songs he’d craft in the years to come, reflecting on the experiences of a young Southern man trying to find his place in the world. With a mixture of outlaw-rebellion and respect for tradition, Riley’s original music has already tallied over 71 million streams to date. Recently wrapping his headlining OUTLAWS LIKE US TOUR, he has built fierce support traveling the southeast for the last six years growing his loyal fanbase on social media. His current single “There Was This Girl” is Top 10 and rising at Country radio and he recently made his national TV debut on NBC’s Today and fulfilled a childhood dream making his debut on the Grand Ole Opry stage last December. Additionally, he was selected as a member of the Opry’s NextStage Program and has been named for both CMT’s Listen Up Artists as well as MusicRow’s 2019 Next Big Things. Named one of Rolling Stone Country’s “Artists You Need to Know,” his IN A TRUCK RIGHT NOW EP on BMLG Records was produced by Dann Huff and features four songs he co-wrote: “There Was This Girl,” “Same Old Song,” “Break Up More Often,” and “In A Truck Right Now.” For more tour dates and more information on Riley Green visit https://www.rileygreenmusic.com/.